Whether you are involved in interval training using a boxing timer or you are sparring with a partner, you know well that throwing a punch the wrong way can cause an injury. In our recent post, we talked about the importance of proper protective equipment for your head, and now we are going to focus on how to prevent shoulder injuries in boxing. How often do these injuries happen? While you are using your entire body to train and become a fighting machine, it is clear that in boxing, the hands, the arms, and the shoulders are exposed to more stress than any other part. That means that you need to focus on these areas to prevent injuries. According to studies, about one-third of all boxing injuries involve the shoulders. 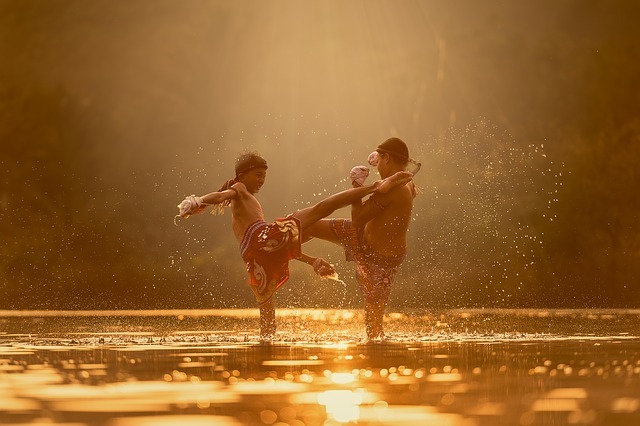 Your purpose is to protect them when you throw punch after punch, but, at the same time, you must make sure that they become more resistant to the type of stress that any training generates. Are you using the right type of gloves? Boxers can wear various types of gloves, and, if you have been involved with the sport for a while now, you know which type must be used under each circumstance. That said, one thing you can do to protect your shoulders is to use the right kind of gloves all the time. If you go for some heavy bag training, you shouldn’t wear light-speed gloves or fingerless gloves that are a good fit for MMA fighters, but not for boxers. Furthermore, don’t wait for your gloves to become worn out; they will start to fail to protect your hands, and you will be the one to suffer the consequences. Also, make sure that you’re using hand wraps diligently to protect your hands, arms, and shoulders during your training sessions. You may think that the power of your punch is guaranteed by how heavy the bag you’re training with is. But heavy bags that oppose a lot of resistance and are stiff will cause a lot of stress to be transferred to the shoulders. Instead, get a double-end bag for regular, day by day training. You will be able to focus more on your technique instead of dealing with shoulder injuries that will only mean a setback. Remember: injuries don’t make you stronger, and steal precious hours and days of training. Strength training is essential for boxers, but boxing is more than just a sport that values strength. It is a sport that counts on fine movements and strategy, and sheer force is not the answer to everything. That is why, when you train with weights, don’t go overboard. Your muscles may increase their strength, but your ligaments, especially the ones in your shoulders, will have to suffer. The same recommendation goes for shadow boxing with weights. Yes, it is true that some champions use this sort of training, but it doesn’t work for everyone. You should not apply too much stress on your shoulders because you will just end up limiting the range of motion. Complex exercises that are aimed at developing body power as a whole should never be carried on without proper supervision. That means that your trainer should have expertise in guiding a trainee through such full body workouts. It is true that using such routines sounds like a great idea to get to the form you want to achieve in a short time. But all the time you hope to gain this way will be for nothing if you get injured. Your shoulders, in particular, might suffer significantly from performing complex exercises without proper care for a clean execution. Due to the nature of boxing, and the routines that are repeated the most, the muscles in the shoulders become round and tight. A common consequence is that boxers tend to have the head jutting forward a little, while their anterior deltoids and pectorals become packed. That can become a problem and a source of injuries for your shoulders. Even dislocations can occur as a result. Therefore you should combat this by performing regular stretching exercises. Ideally, you should go for stretching the shoulders, by bringing them together, and pulling them down, alternatively. The neutral grip is the name given to the position of the palms facing one another when performing strength exercises. When your arms are positioned like that, there is no additional stress applied to the shoulders. Using conventional barbells will force your palms to face down or up. But, by using dumbbells, you can perform strength exercises that allow a neutral grip. This way, you can focus on developing muscle power, but without forcing your shoulders into the wrong position. Boxers are known to develop different punching styles that become signature moves for champions. You may always get inspired by famous boxers in creating your own style. Yet, at the same time, you need to understand what will work for you, as an individual. If you repeatedly commit the same mistake, by trying to adapt to a punching style that’s not for you, you’re exposing yourself to the risk of shoulder injuries. Due to the repetitive nature of the punching exercises you will perform as a boxer, you can increase gradually the stress applied to your shoulders until an injury occurs. The last piece of advice is this: don’t rush to obtain results. As explosive as boxing appears on screen when you’re watching matches between big names, what you see there is the result of arduous and patient training. You cannot become a better boxer if you increase the risk of shoulder injuries. Instead of rushing to become better, take the slow and steady approach. Besides results in the ring, this approach will also protect you from injuries and pain.